A trip to Leh, the land of high passes, literally fell into my lap. How could I refuse? I knew next to nothing about the region and this was as good a time as any to find out. Leh is a spiritual experience. Much of this beautiful region is untouched by the modern world, one feels the connect with Nature. 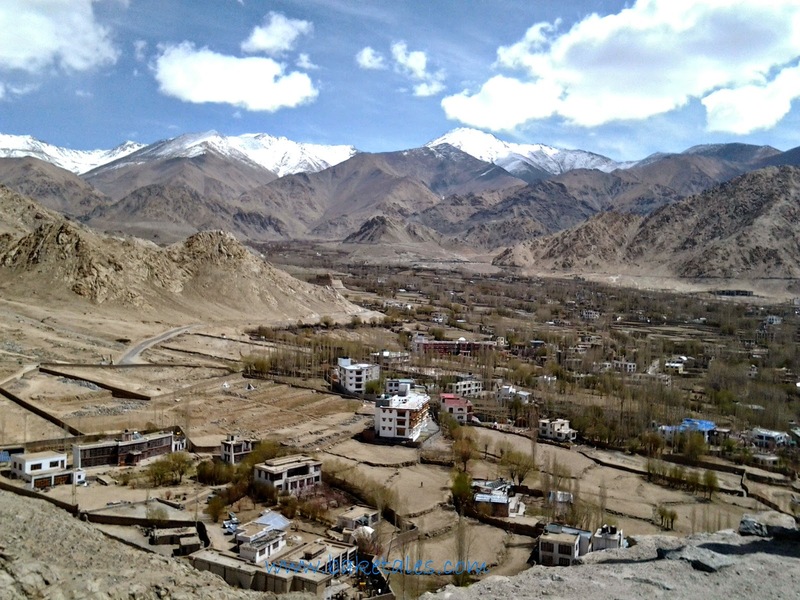 Leh's beauty lies in the starkness and barrenness of the mountainous landscape. All your senses absorb the physical parameters and you feel welcomed and embraced by the very air that you breathe. We were a group of 13 and all of us wanted window seats on the morning flight from Delhi to Leh. 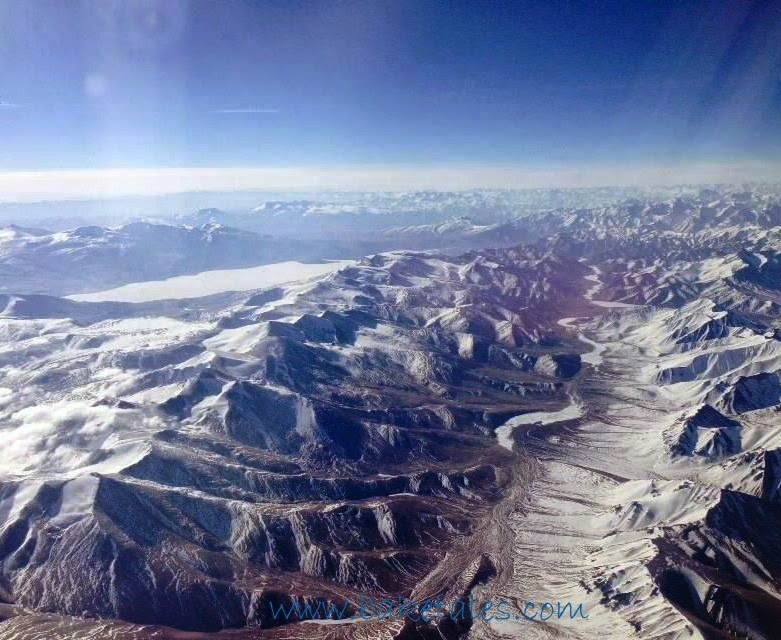 The excitement in the plane was so palpable when the first peaks of the majestic, rugged, snow covered peaks of the Himalayas came into view. All too soon, we landed at Kushok Bakula Rimpochhe airport; the cold weather was a welcome change from the heat of Chennai and Delhi, or so we thought! 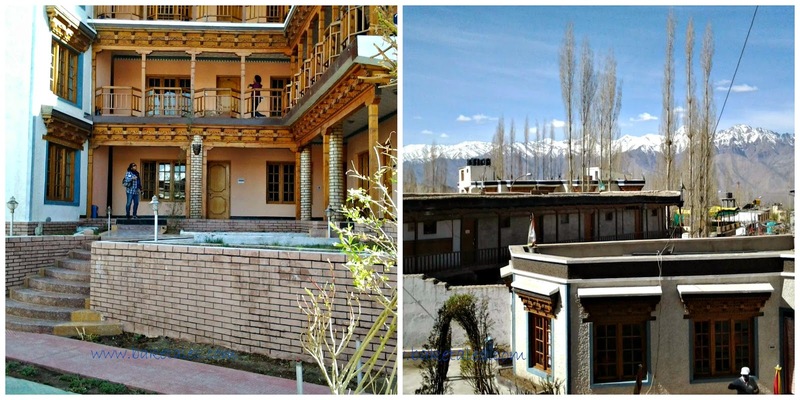 Leh sits at an altitude of 3500 meters. It's a small town and incredibly dusty. There was plenty of construction work going on, both of roads and buildings. I guess in 10 years from now, the place and the pace of life would be unrecognisable. Our ambitiously named hotel, Grand Willows, had lots of poplar trees around. There was a little garden in the courtyard with cane chairs under the shade of beach umbrellas. It was about then that the cold hit us and sent us rummaging through suitcases for jackets and woollens. The little courtyard was flooded with sunlight. We flopped down on the chairs and gazed at the snow capped mountains. In Leh, the mountains are everywhere. We had been given rooms on the first floor and when we started climbing the stairs, we realised how difficult it was to breathe. We had been warned not to exert ourselves the first day. Forget exerting, breathing itself was tiring. Our hotel was situated on Fort Road, a narrow road with shops and bakeries on either side. The stores sold Kashmiri shawls, trinkets, woollen clothes and other handicrafts. Our first local sight seeing trip was to Shanti Stupa and the nearby monastery in Changspa village. Situated 5 kms from Leh town, every turn we took on the mountain roads afforded a facet of the pristine white stupa which stood like a sentinel. The stupa was on two levels and the reliefs on the upper level depicted Lord Buddha's birth, death and his defeat of evil during meditation. The stupa was built jointly by Japanese and Ladakh Buddhists to promote world peace. Another trip was to the the Samkar Gonpa, a branch of the Spituk monastary. 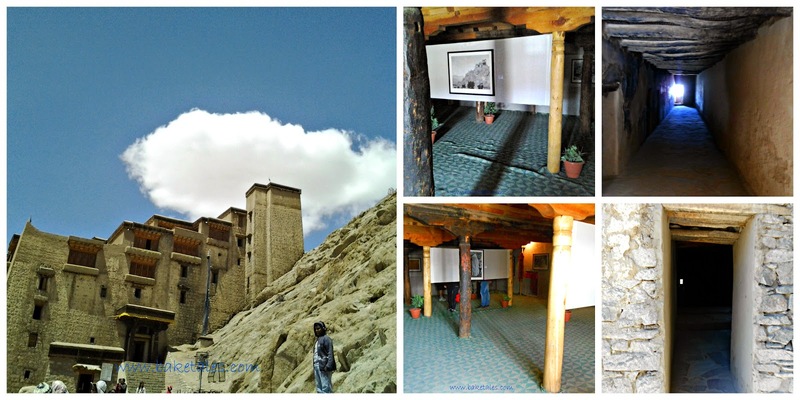 We ended our day with a trip to the 9 storied Leh palace, designed on the lines of the Potala Palace in Tibet. Dusty and dilapidated, it was a rabbit warren of tiny rooms. The few rooms we entered were bare except one which had a threadbare carpet and a few paintings and photographs. A lot of the passages looked decidedly eerie. 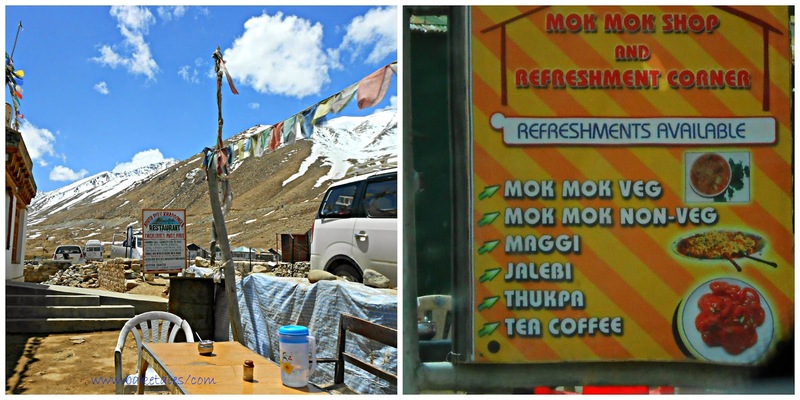 We set out the next day for Nubra valley, also known as the valley of flowers. 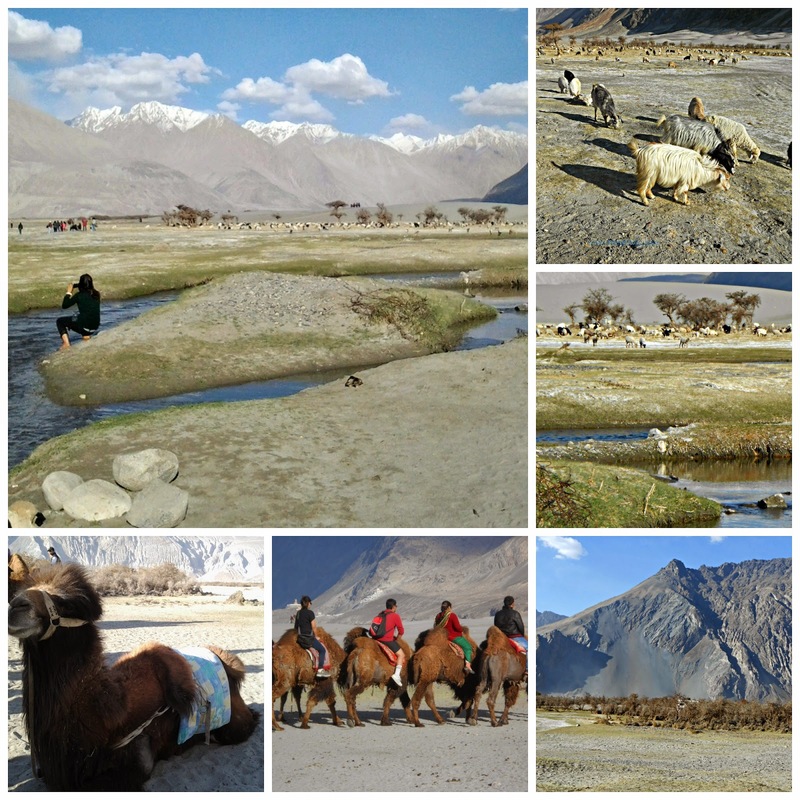 Nubra is a high altitude desert which separates Ladakh from the Karakoram range. It was a long drive that would take us through Khardung La pass before descending into the valley. Driving on mountain roads needs special skills and a lot of care and our convoy of 3 cars were driven by capable young men. The long drive around snow covered mountains was an experience of a lifetime. The sun had melted the top layer of snow which formed rivulets and trickled down the slopes. Finally we reached Chamba Camp at Hunder, a tent camp run by monks. The cold was not as intense as it had been in Leh. It was very comfortable in the tent which even had an "en suite" bathroom. Hot cups of tea fortified us and then we went in search of the Bactrian camels with their distinctive double humps. Such a picturesque setting, with a small river running through and clumps of seabuckthorn bushes, unique to the region, provided excellent photo ops all around. 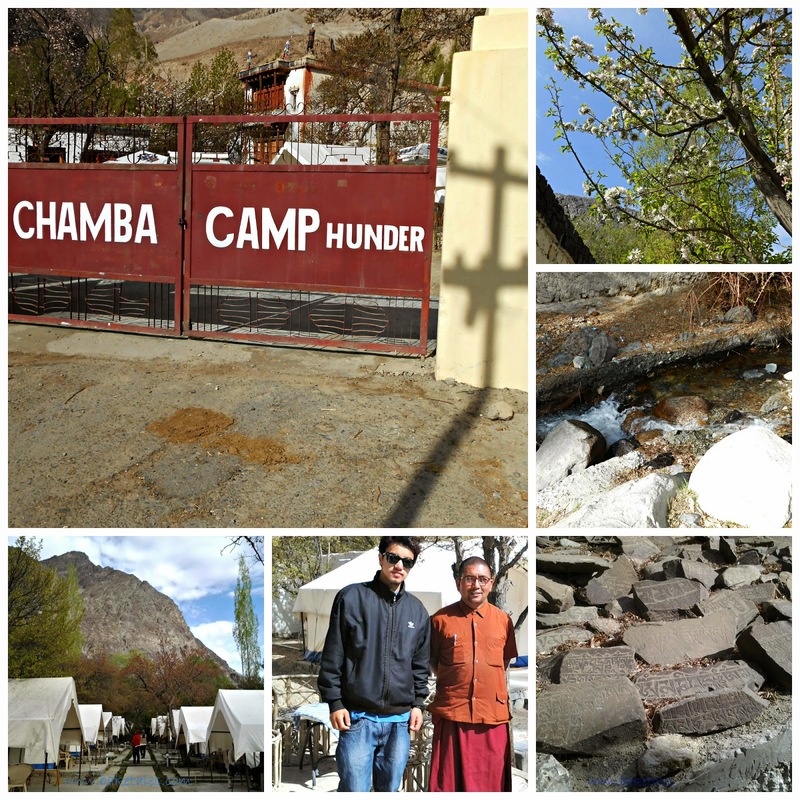 Back at Chamba camp, we took a stroll around and outside the camp. The air was thick with the sweet scent of apple blossoms and the apricot trees were in full bloom. The camp had a dining hall and that night, we were served one of the most delicious of vegetarian meals - piping hot soup, phulkas, paneer and spinach, a simple dhal curry and rice. 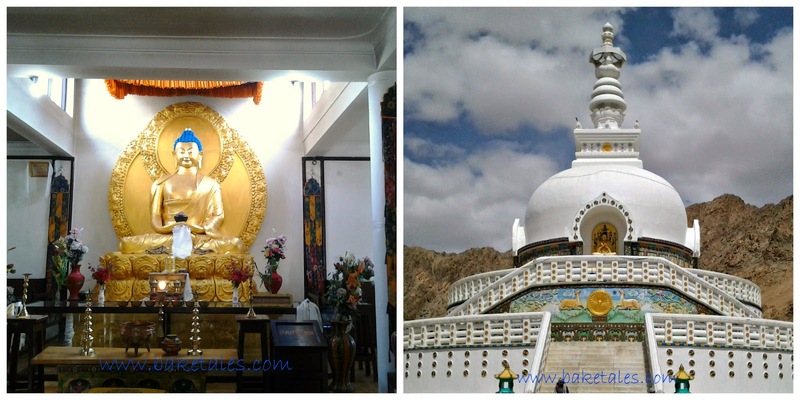 On the drive back to Leh, we stopped at the Diskit Monastery, noted for the giant statue of Maitreya Buddha. We had to drive through the Khardung La Pass again. The Pass was once a route for caravans to India from Central Asia and is a little way away from the Siachen Glacier. Along the way there were many rest stops serving tea, Maggi noodles and other refreshments. Another day, there was a trip to the Hall of Fame Museum at Leh. Most interesting was a 3D relief map of the entire region. Exhibits included weapons, clothes and survival tents that soldiers of the Indian army used during the Kargil war and in the Siachen area. Along with the Army that protects the inhospitable border areas of the country, the Border Roads Organisation, particularly the HIMANK project which builds roads though some of the highest passes in Ladakh and maintains them, are truly deserving of the nation's gratitude. 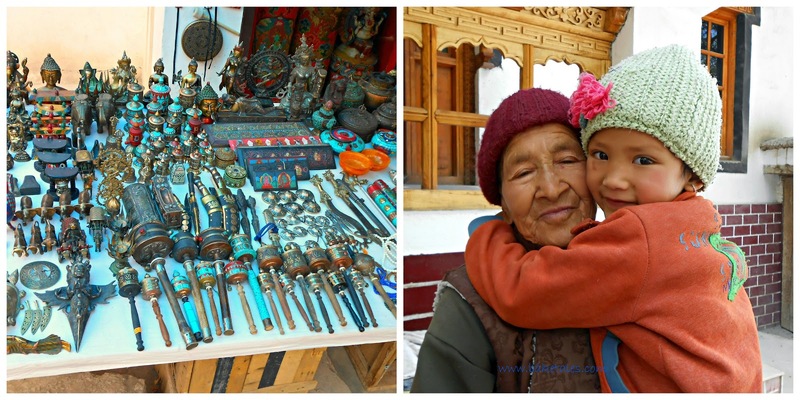 At Alchi, a tiny village in the Indus valley, we got out of the cars and walked down a winding little pathway that took us past little houses, giving us glimpses of life in a typical Ladakhi village. There were many stores selling jewellery and souvenirs. The pathway finally led us down to the Chos Kor, or religious enclave of five temples. On the way back to Leh, we drove right up to the confluence of the Indus and Zanskar rivers. 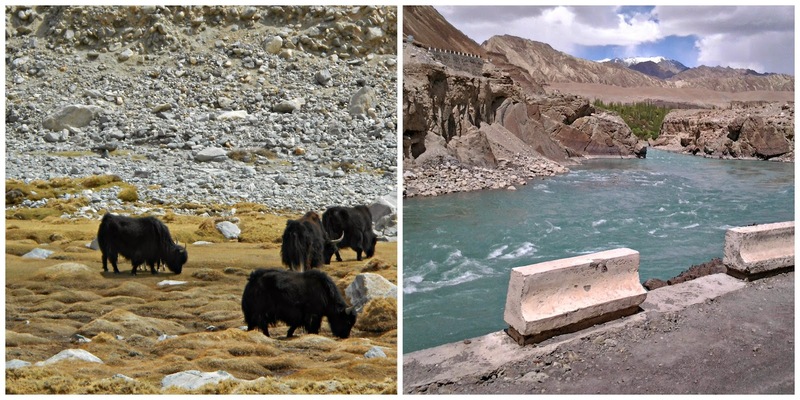 The water of the Indus was clear, not so with the Zanskar. Nevertheless, it was a magnificent sight. 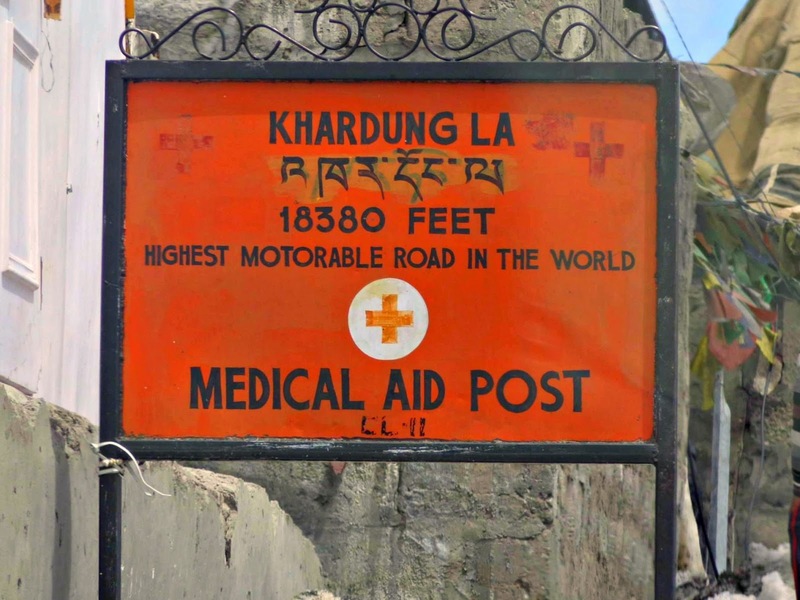 After a five hour drive and through the Chang La pass, we reached Martsemak camp. 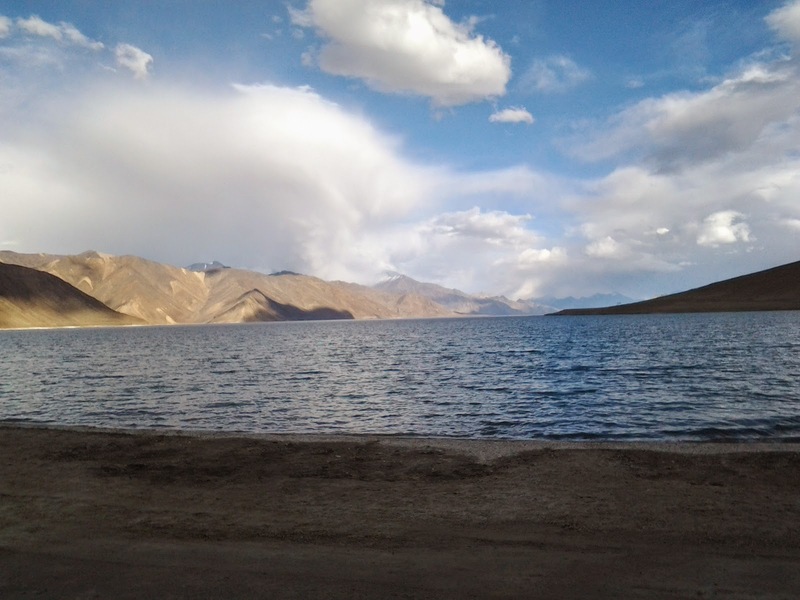 We had heard about the Pangong Tso (lake) and could make out a length of blue ribbon ahead. But first, we had to check into the camp. And it was freezing cold. How cold is cold? -3°C that afternoon with a few swirls of snow. Do remember that we had come in from Chennai with its 37°C heat. 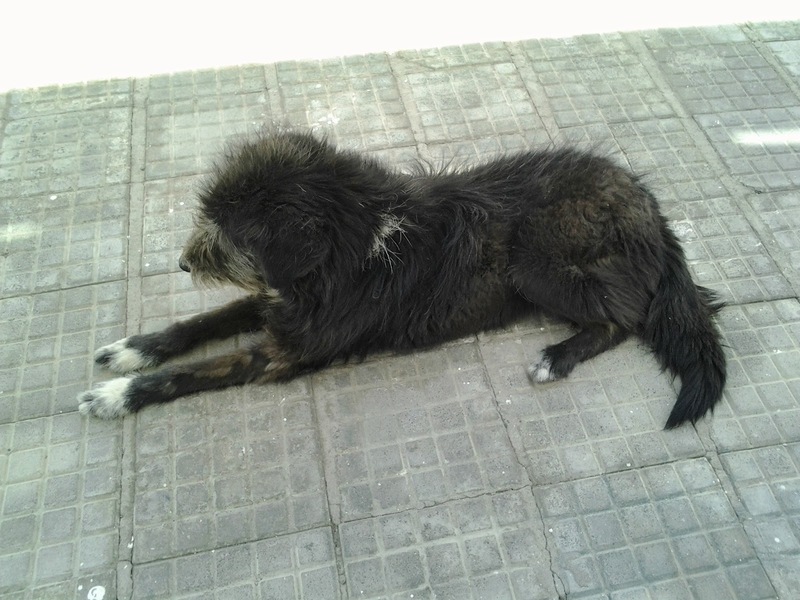 We had to walk about half a kilometer to the shore of the lake. 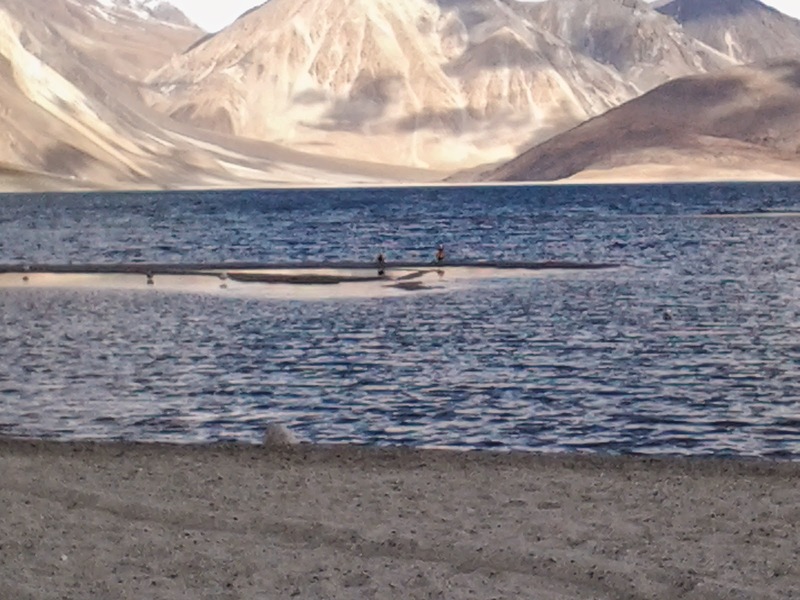 In Tibetan, Pangong Tso means 'long enchanted narrow lake'. And believe me, it looked like a surreal painting. Situated at 4250 meters above sea level, it was a long stretch of water in the most unbelievable shades of blue. About 60% of the lake lies in Tibet and although the water is brackish (yes, I tasted it), the lake freezes over in winter. If there is a Paradise on earth, it must surely be here. That night, the camp staff lit a bonfire for us. In that freezing cold, the fire burnt bright but there was no heat! We went to bed with 3 blankets and a hot water bottle each and spent a most comfortable night. 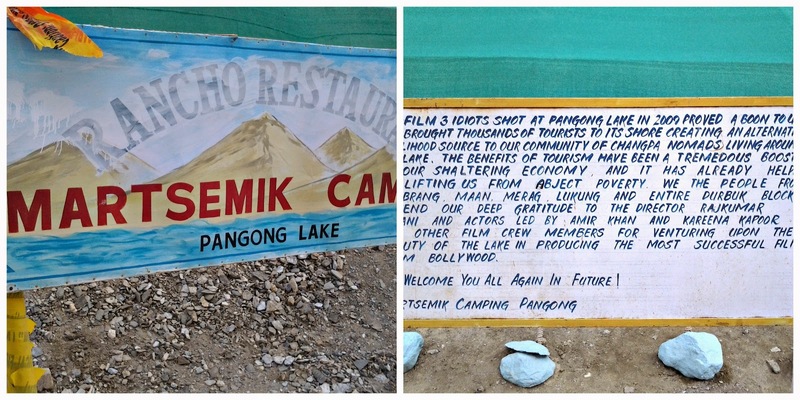 The next morning, we were driven to the spot where the Bollywood movie "3 Idiots" was shot. It was a still, silent world punctured only by birdcalls and the gentle lapping of water on the shores of the lake. I hope the authorities will always preserve the beauty and serenity of Pangong Tso and will not allow commercialisation and exploitation of this unique wetland. I would love to go back to Leh for another visit. This time, I would definitely leave behind my camera.